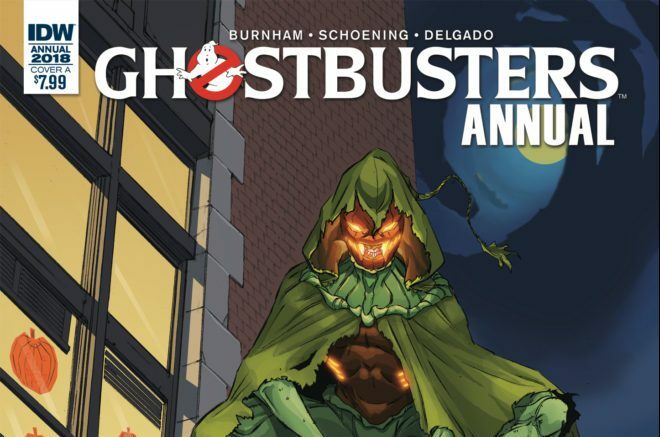 Our favorite villain from the classic Real Ghostbusters animated series is back, as Sam Hain returns in the new Ghostbusters Annual 2018 comic book. Released in March from IDW Publishing, Ghostbusters Annual 2018 sets the stage for what promises to be the ultimate mash-up of all the different versions of the Ghostbusters, including the originals, the new ladies from the 2016 film, and the animated versions. The character Sam Hain, who is familiar to fans of The Real Ghostbusters cartoon, is accidentally unleashed again after miners beneath New York City discover a strange artifact. As the Ghostbusters get involved to save the day, they learn that the pumpkin-headed ghost is connected to the Irish tradition of his namesake, Samhain, which of course was the pagan Celtic predecessor to Halloween. This issue sets up the new multiverse crossover event Ghostbusters: Crossing Over, a monthly series that started in March and continues through October, which will see the original Ghostbusters from 1984 teaming up with the gals from the 2016 film, as well as the Real Ghostbusters and even the Extreme Ghostbusters. You can see the cover art below, and then order your copy of the Ghostbusters Annual 2018 comic through Amazon here.